I am a huge fan of fresh flowers in my house. I love going to the markets and hand picking various flowers to adorn my countertops, sideboards and dining room table. It’s something I usually do a lot of in Spring and Summer time but it got me thinking why not winter time too? There is nothing that perks me up then beautiful blooms and when the skies are dark and gloomy and the backyard is bare and full of frost it would be inviting to see gorgeous fresh flowers inside. 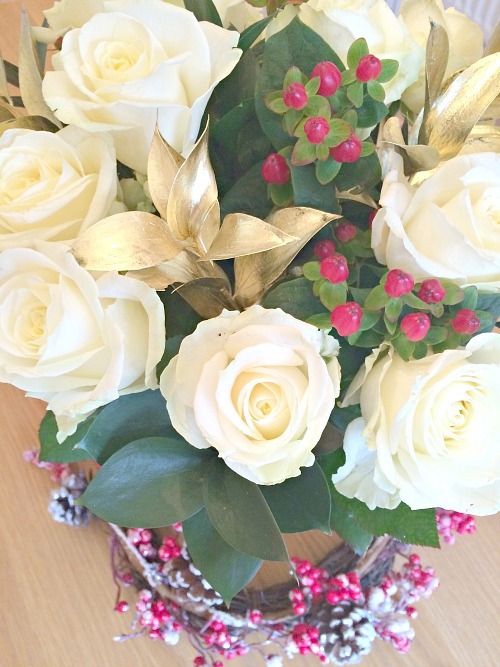 I am teaming up once again with the amazing Appleyard London for their fabulous Christmas boutique flowers! I am one of those that decorate each room as much as possible so when I received these absolutely stunning Christmas flowers for my dining room table I had to squeal. It really finished off our Christmas decor in the dining room. I can smell the roses while we eat which is not a smell anyone would refuse but one you wouldn’t get in winter time so it’s welcoming. 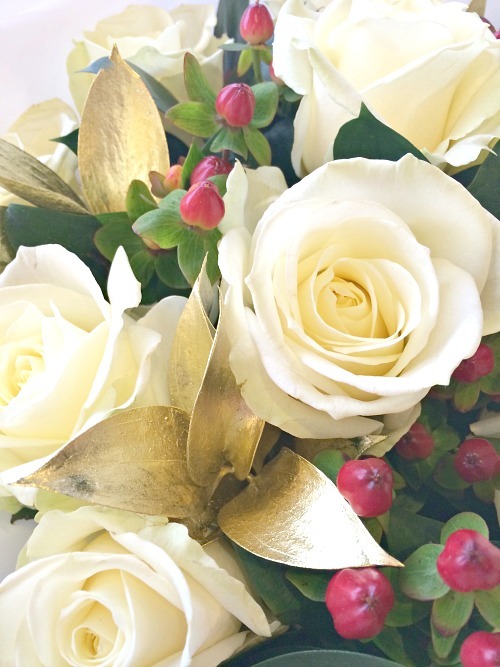 I fall in love for metallics every time and the gold leaf theme really sets off the Christmas feel to this bouquet. With the dark days these photos don’t do it as much justice as it does in person, the gold shimmering and the berries pop out from between the white roses is a great Christmas combo. I am a softy for white roses too. I would prefer them over red roses any day. They are romantic and friendly and fit every occasion! 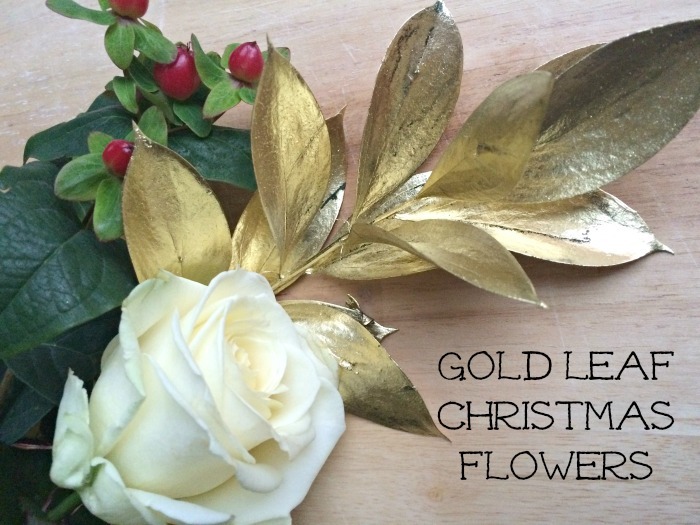 The Gold Leaf Christmas Bouquet would be perfect for a Christmas present for yourself or a loved one. It’s easy to order online and comes packaged safely right to your door, fresh and stunning. There are so many various ways you can spread flowers throughout your home. Whether you love to cut them down and put them in various little bottles or displaying them in a huge arrangement as a centerpiece; flowers are bound to make everyone smile in the house. Even better if you get that surprise delivery at the front door from a loved one! Who doesn’t love surprise flowers as a pressie? I have added mine with a berry wreath for the dining room table for Christmas. I love the festive season and everything that comes with it from decorations, to baking to family time it’s all so magical. 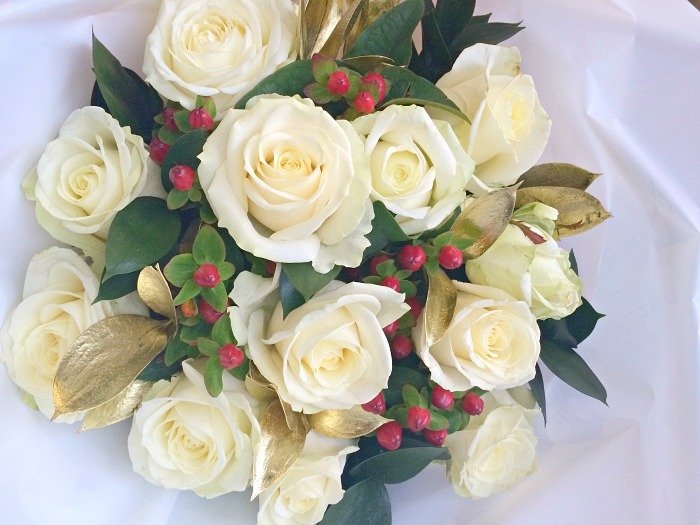 Everyone seems to be in the festive mood as well and Appleyard London are right along with us and are offering all my lovely readers 40% their luxury bouquets using the discount code BLOG40! Have a loved one you want to spoil this Christmas take advantage Appleyard London are super speedy on delivery! You could be making someone smile at their front door too! * I was sent these flowers for the purpose of this review but all photos and opinions are my own. Thanks Kelly I think so too. Beautiful flowers! 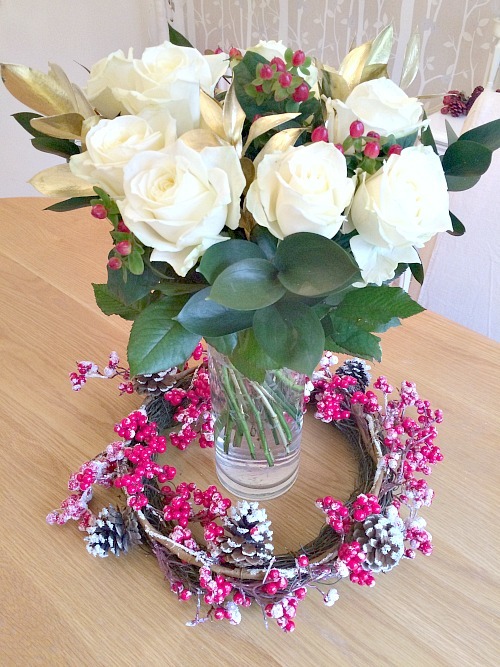 Is there anything better than a lovely fresh cut bunch to brighten up any room! Totally agree, I love fresh flowers. I wish these actual were fake so they looked like this all winter long I am in love with them. Appleyard London do amazing flowers they always look so perfect. I have received a few from them now amazing every time. Me too I almost wish they were fake or I could afford them all winter as they look so amazing in my dining room! They are So gorgeous! I wouldn’t normally have thought about buying flowers at Christmas but you’ve sold me on the idea! I think so too. Although they are so perfect i wish they were fake so i can have them all winter. So pretty. Flowers pics are looking so perfect obviously white flowers looks amazing always. Yes I love white roses. I tried always have fresh ones in the house. ‘oh so lovely flowers. i really like it.